Earthrise tells the story of the first image captured of the Earth from space in 1968. Told solely by the Apollo 8 astronauts, the film recounts their experiences and memories and explores the beauty, awe, and grandeur of the Earth against the blackness of space. It’s been a while since we’ve had a proper #LongShort Saturday, and at a hefty 28min, site alum Emmanuel Vaughn-Lee‘s newest documentary, Earthrise, certainly counts. The film earns it’s length though, recounting a pivotal moment in history with a nostalgic lens that nonetheless aims to resonate with, and inspire, audiences exhausted by our modern ills. 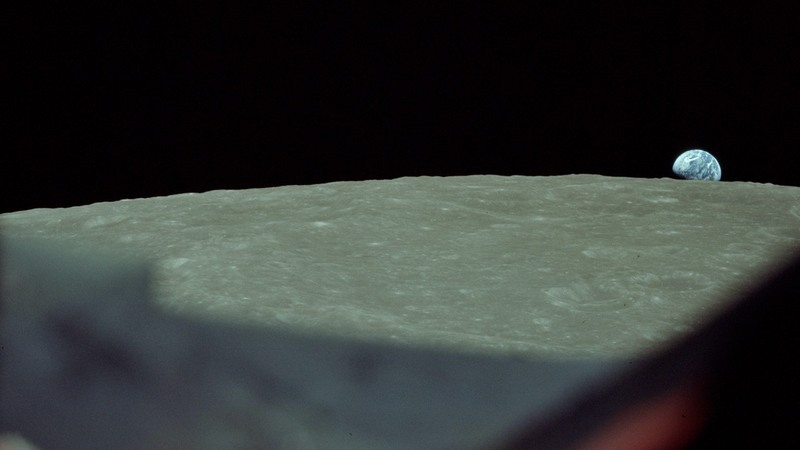 Earthrise utilizes terrific archival material, and well-produced interviews, to present an immersive first-person account of the Apollo 8 mission, timed to its 50th anniversary. Subsequently overshadowed by the Apollo 11 mission, which landed a man on the moon, and by the heroics surrounding the failed Apollo 13 mission, the significance of Apollo 8 has faded somewhat, but is still incredibly significant—the first manned mission to break out of Earth’s low-orbit, the crew of Commander Frank Borman, Command Module Pilot James Lovell, and Lunar Module Pilot William Anders became the first humans to see Earth as a whole planet. Broadcasts of their mission were, at the time, the most watched television events in history, and the trio won Time’s “Men of the Year” in 1968. Even more enduringly, the photographs they took as complete afterthoughts of the surreal “earthrise” became iconic images that forever changed humanity’s self-conception. Space documentaries are a popular niche, and you probably know immediately whether this film is up your alley. Not being a devotee of the form myself, I’ve never seen the long multi-hour landmarks of the genre such as From Earth to the Moon, For All Mankind, or When We Left Earth, so I can’t speak to the freshness of Vaughn-Lee’s approach with Earthrise, but I was certainly captivated in viewing it. There is an undeniable romanticism to the early space missions that is intoxicating, and is surely no small part of their enduring appeal. History aside, Vaughn-Lee and his team get great access and performances from the astronauts they interview, and the archival work that he and his editor Adam Loften surface is fascinating to watch, a charming and tactile counterpoint to the highly polished images of space that we readily have access to now. Vaughn-Lee, unlike myself, is a space-nerd, and has long been captivated by the Apollo missions. The “earthrise” photo specifically hold a privileged place in his, and many others hearts. The first chance to see the planet as a whole, from a removed vantage point, it has an odd psychological effect, and many attribute the rise of the environmental movement and “Earth Day” to this breakthrough, and in a plaintive request the film asks if this concept of wholeness and unity is something worth revisiting in the midst of our political and cultural divisiveness. After a strong festival run that included Tribeca and the Audience Prize at AFI Docs, the film came online earlier this week as an NyTimes Op/Doc. Television broadcasts are also scheduled through PBS’s POV program. As for Vaughn-Lee, he is interested in VR and adapting aspects of Earthrise to that format.